No date for this photograph. When do you think it was taken? Have a hankering for air-conditioning and old photographs? Drop by our reading room and dive into our University Photographs! We’re open Monday-Friday from 9 to 5. This week and next the library is open 24/7 to provide a space for students to prepare for semester finals. 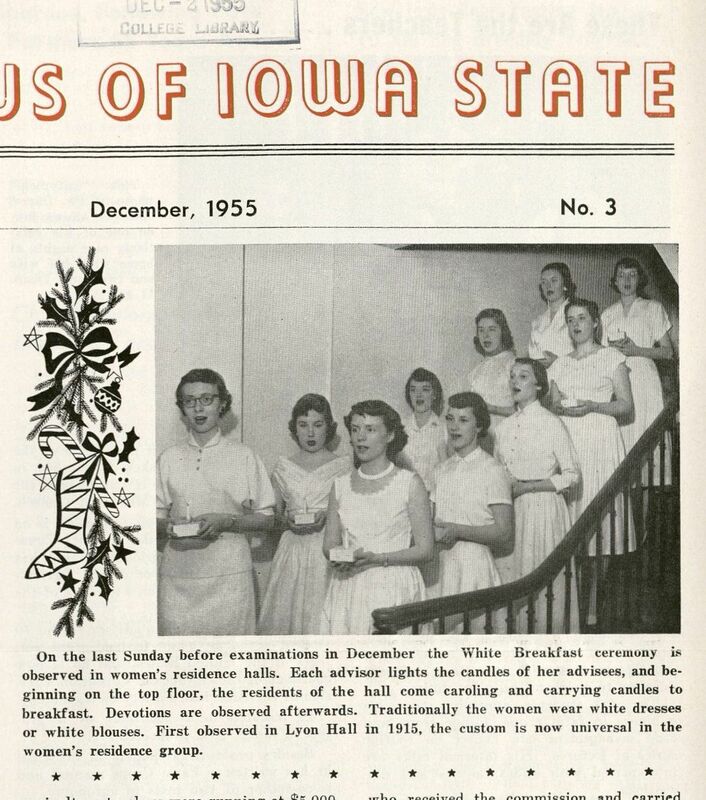 Apparently spending “countless hours” at the library is nothing new to ISU students! Good luck with finals, everyone! It is not often that I get to see the results of my Special Collections instruction sessions in such a tangible way. Back in February, I worked with April Katz’s Intaglio class, who came in to view and take photos of examples of intaglio prints from a variety of our rare books to incorporate into their own studio projects. In April I had the pleasure of attending the class’s final critique and seeing the fruits of their labor. All of the prints were inspiring and beautiful to see. I am highlighting here a few in which I could clearly decipher where the inspiration came from in our collections. Here, for example, is the work of Jen Wichers, who took as inspiration images from a book on French fashion from the 1780s (Cornu, Paul, et. al. Galerie des Modes et Costumes Francais. Paris: É. Lévy, 1912?. Call number: GT865 G132). Plate taken from “Galerie des Modes et Costumes Francais,” vol. 4, plate 283. Anna Wagner was inspired by images of tools from Diderot’s French Enlightenment Encyclopédie (Diderot, Denis. Encyclopédie. Paris: Briasson, etc, 1751-65. Call number: AE25 En185) in these prints of hammers with entwined flowers. Possible source of inspiration found in Diderot’s Encyclopedie. “Serrurerie,” plates vol. 9, plate 51. From volume 2 of “Flora Boreali Americana,” plate XVII. Here is a final set of photos of the work of Jordan Jorgensen, who was also inspired by Diderot. I like the interplay of the hand tool (scissors) and the larger machine (spinning wheel) and the faceless woman running it. From Diderot’s Encyclopedie, plates vol. 4, “Fil, Rouet,” plate II. Thank you to April Katz’s ARTIS 357/557, Intaglio & Monotype class for allowing me to attend your final critique and show off your work on our blog. You did great work! Today Professor Lisa Ossian, from Des Moines Area Community College (DMACC), brought her Western Civilization & U.S. History classes to learn about primary source research in Special Collections & University Archives. Some of the students headed into our reading room or the library’s Media Center afterwards to start their research for their assignment. Contact us for more information on our instruction program.